Andy Potter, Beatriz Mourad, & Hayley Nabuurs recap Episode 4 of gen:LOCK, “Training Daze”. Dylan Hysen, Hayley Nabuurs, & Andy Potter recap the Volume 6 finale of RWBY, “Our Way”. Dylan Hysen, Hayley Nabuurs, & Andy Potter recap Episode 12 of Volume 6 of RWBY, “Seeing Red”. 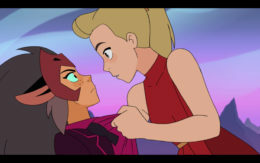 Beatriz Mourad, Sam Quattro, and Hayley Nabuurs discuss the angst that is Catradora (AdoraxCatra). Dylan Hysen, Hayley Nabuurs, & Andy Potter recap Episode 10 of Volume 6 of RWBY, “Stealing from the Elderly”.